The Dallas County Sheriff fired back at what she called inaccurate rumors on her immigration policies during an interim House committee hearing Thursday. Lawmakers also heard about an ill-conceived law that is hindering the state's identification of criminals. 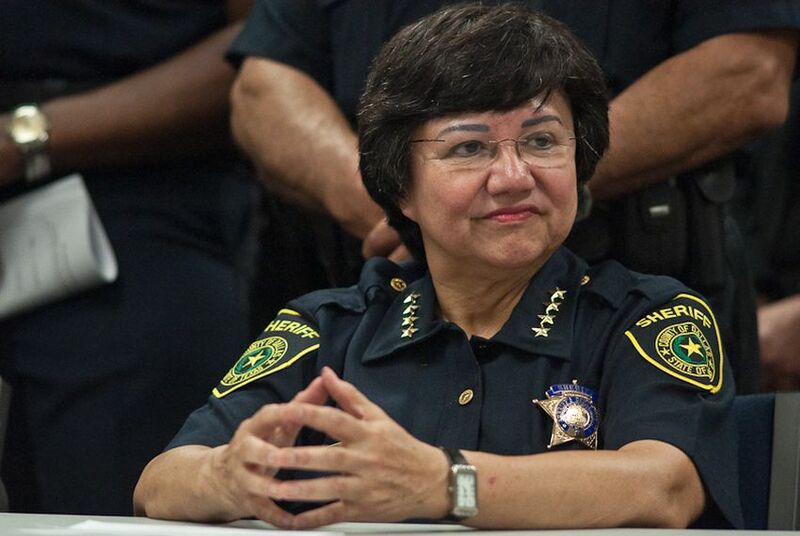 The rumor that she isn’t tough on criminal immigrants who pass through her jail has grown like a well-fertilized plant, embattled Dallas County Sheriff Lupe Valdez told a panel of state lawmakers on Thursday. And the head of Texas’ state police force told the same group that a fingerprint measure championed by Republican lawmakers has only hindered the department’s efforts to identify possible criminals, including undocumented immigrants. The remarks came during the first of several interim hearings by the House State Affairs Committee, which is charged with investigating state-based immigration enforcement and local agency cooperation with the federal government. Valdez has been in Gov. Greg Abbott’s crosshairs since announcing last month that she will honor requests from Immigration and Customs Enforcement to hold inmates, known as ICE detainers, on a case-by-case basis. But she said her comments were taken out of context following a meeting she had with ICE officials and immigrant advocates about how her jail was detaining — and then handing over — immigrants to federal authorities. “And that is when we said that is a case-by-case situation,” she explained about the confusion, which subsequently led to Abbott threatening to withhold state money from any department that didn’t cooperate with ICE. Some testimony Thursday mirrored what a Senate panel heard on the same issue last week — witnesses were unable to name a Texas county that isn’t turning over criminal immigrants under the guidelines of the federal government’s Priority Enforcement Program, or PEP, that the Department of Homeland Security implemented earlier this year. It instructs immigration agents to focus deportation efforts on convicted criminals or those that “pose a threat to public safety,” according to ICE. The panel also heard about an unintended consequence of what was thought to be a minor issue that has instead hampered the ability of the Texas Department of Public Safety to identify possible alleged criminals. Earlier this year lawmakers passed House Bill 1888, by state Rep. Giovanni Capriglione, R-Southlake, which dealt with penalties for driving a commercial vehicle without a license. But, citing privacy concerns, the bill was amended to instruct the agency to delete its current collection of full sets of fingerprints and only take a thumb or forefinger print from applicants for driver’s licenses and other ID cards. Texas DPS Director Steve McCraw said it has “absolutely” taken from the department a valuable tool to help identify people who may have committed crimes. After the hearing, committee State Affairs Chairman Byron Cook, R-Corsicana, said McCraw’s testimony validated the concerns he had about the proposal during the session. Lawmakers also heard from Terrell County Sheriff W. Clint McDonald, chairman of the Texas Border Sheriffs’ Coalition. McDonald spun a different tale than some border Democrats who say the area is more patrolled and safer than ever. Unlike California, Arizona and New Mexico, Texas doesn’t have government land on the banks of the river, McDonald said. That makes it hard to gain access when private landowners balk at law enforcement on their property. He’s also said his department is understaffed, and federal agents are fewer in number than ever before. Several times during the hearing, Cook made a reference to House Bill 12 from the 2011 Texas Legislature, the first proposal to ban sanctuary cities that passed out of committee and navigated through the House chamber only to die in the Senate. Deputy Attorney General Brantley Starr said the bill, if passed today, would likely hold up to a constitutional challenge. Cook said after the fact that the measure could provide a blueprint for lawmakers in 2017. He also pushed back against attacks by some conservative groups that Cook and other lawmakers, including House Speaker Joe Straus, are soft on immigration.